Hurricane Sandy is another reminder of just how incredibly fragile the thin veneer of civilization that we all take for granted on a daily basis really is. Many of the hardest hit areas along the Jersey shore and the coast of Long Island have descended into a state of anarchy. More than 7 million people live on Long Island, and millions more live along the Jersey shore and right now they are getting a taste of what life would be like during a total economic meltdown. At the moment, there are still approximately 4.7 million homes and businesses that do not have power. Officials say that some of those homes and businesses may not have their power restored until the weekend of November 10th and 11th. Meanwhile, it is getting very cold at night. This weekend the low temperatures on Long Island are supposed to dip into the upper thirties. There have been reports of people diving into dumpsters behind supermarkets in a desperate search for food, and there have been other reports of roaming gangs of criminals posing as officials from FEMA or Con Edison and then robbing families at gunpoint once they have gained entrance into their homes. If people will behave like this during a temporary emergency that lasts only a few days, what would they do during a total economic collapse? That is a frightening thing to think about. Most gas stations along the Jersey shore and on Long Island are either totally out of gasoline or they don’t have any power to operate the gas pumps. It is estimated that more than half of all gas stations in New York City are closed at the moment, and officials say that more than 80 percent of all gas stations in New Jersey are not able to sell gas right now. So needless to say, the lines at the gas stations that remain open are horrific. 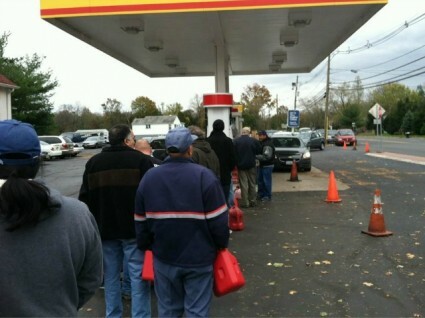 It is being reported that some people are waiting in line for hours for gasoline in some areas and that state troopers have actually been deployed at every gas station along the New Jersey Turnpike and the Garden State Parkway. You know things are bad when you ask the gas station attendent “when do you think you’re going to get more gas?” and he just laughs at you. Unfortunately, authorities are projecting that the gas shortage may last for another week at least. How angry and frustrated will people get by that time? I live in Massapequa NY …..No power to 95%. almost every home south of Merrick Road ( 1.5 miles from open water ) has been flooded. 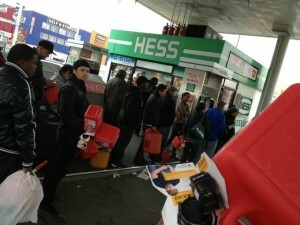 No electricity, no supermarkets in immediate area, no gas (approx 80% of gas stations closed on Long Island). This was not just another storm. It was a life-altering event for millions of people. Unfortunately, just as we have seen after every other major storm in recent years, looters are taking advantage of the chaos caused by Hurricane Sandy. In the Rockaways, lowlifes were sneaking into clothing stores and cleaning out pizzerias. Two men and a woman were arrested for robbing a BP gas station on Beach Channel Drive, three men and one woman were cuffed for pillaging a Radio Shack on Beach 88th Street, and two people were arrested for raiding a clothing store near Beach 86th Street, cops said. Stores were emptied along a two-block stretch of Mermaid Avenue in Coney Island. Seven people were busted. Thieves broke in to the badly damaged Mega Aid Pharmacy on Mermaid Avenue and reportedly stole more than 10,000 pharmaceutical items, including prescription drugs. “The water went away and these people started walking down the streets and just robbed stores,” a pharmacy worker told HuffPo’s Andy Campbell. Looters reportedly also targeted banks, other shops, and other pharmacies. “People are turning on each other — they’re attacking each other,” Ocean Towers resident Dena Wells told Campbell. Amazingly, a number of not-so-smart looters have actually been displaying their looted goods on Twitter. Just check out the shocking photos in this article. Nearly 20,000 people have been trapped at home in the New Jersey city of Hoboken, just across the Hudson River from New York City, amid accusations that officials were slow to deliver food and water. One man blew up an air mattress and floated to City Hall, demanding to know why supplies had not reached residents – at least a quarter of homes there are flooded and 90% do not have power. If this is how angry and frustrated that people become over a temporary disaster, how angry and frustrated would they get if there was a total economic meltdown that was permanent? Sadly, the truth is that what we are seeing during the aftermath of Hurricane Sandy is just a very small preview of what is coming on a national level. Our economy is a complete and total mess right now, and things are going to get a whole lot worse. When unemployment starts skyrocketing again and large segments of the population realize that there is no hope for a turnaround, many of them are going to totally give in to despair and become very desperate. 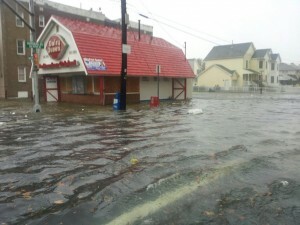 And as we are seeing along the Jersey Shore and on Long Island right now, desperate people do desperate things. That is why I am constantly pounding on the need to prepare for what is ahead. There are signs of social decay all around us, and most Americans are not equipped to deal with the pressures that come with a major emergency. When things totally fall apart, you don’t want your family to be totally unprepared and surrounded by millions of angry and desperate people. Hopefully Hurricane Sandy will serve as a wake up call for millions of American families. Time is definitely running out, and we all need to get prepared while we still can. 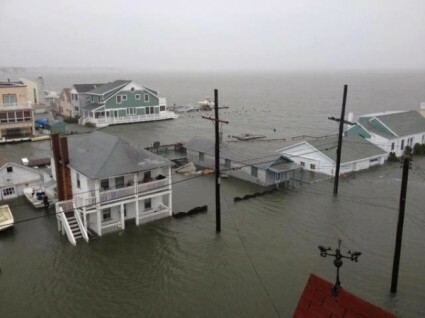 It is hard to put into words the absolute devastation that we are seeing along many areas of the east coast right now. Boats have been washed ashore, homes have been razed, some coastal roads have been essentially destroyed, and large numbers of people are still trapped in their homes by flood waters. It is being reported that more than 50 people are dead and more than 8 million people along the east coast have lost power. Those without power might not get it back for a week or more. In New York City, an all-time record storm surge of almost 14 feet caused incredible destruction. It is going to take months for New York City to recover, and along the Jersey coast things are even worse. 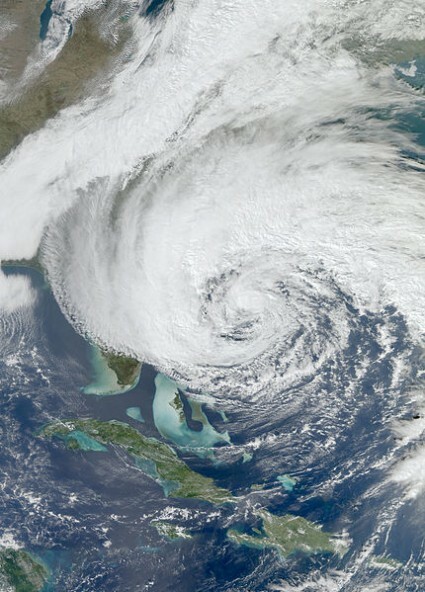 Hurricane Sandy really did turn out to be “the worst case scenario” for much of the eastern seaboard. At this point more than 15,000 flights have been cancelled, and nobody knows when subway service in New York City is going to be restored. More than 4 million people a day use that subway system, and right now many of the most important tunnels are absolutely flooded with water. Sadly, this crisis is far from over. The storm formerly known as Hurricane Sandy has moved inland over Pennsylvania where it continues to do a tremendous amount of damage. The full extent of the destruction caused by this storm will probably not be known for weeks. We have truly seen some unprecedented things during this storm. For example, a 168 foot long tanker was driven ashore on Staten Island. Right now the tanker is sitting on Front Street. In the beachfront Queens neighborhood of Breezy Point, a massive fire broke out and burned just about everything that was not already flooded. The blaze destroyed close to 100 homes, and by the end of the fire more than 190 firefighters were battling it. Some areas in the West Virginia mountains have already had up to 3 feet of snow, and yet it just continues to fall. When all of that snow starts to melt in a few days, tremendous flooding is anticipated. The northeast has never seen a storm quite like this, and the ripple effects are going to be felt for years to come. So what will this storm ultimately cost the U.S. economy? Well, Fox News is reporting that the total cost could reach 45 billion dollars. Others estimate that the economic toll may be even higher than that. But one thing is for certain – at a time when layoffs are already surging, this is definitely not going to help. The U.S. economy is showing lots of signs of slowing down again, and this storm may have just nudged us even farther in that direction. Hopefully we will have some time to recover before the next major crisis strikes, but with the election coming up early next week that does not seem too likely. Meteorologists are warning that Hurricane Sandy could potentially be the worst storm to hit the east coast of the United States in 100 years. Do you remember “the perfect storm” back in 1991? That storm was so bad that Hollywood made a blockbuster movie starring George Clooney about it. Well, this storm is going to be much worse. When I first heard about Hurricane Sandy, I didn’t make that much of it. I figured that the east coast would get some wind and some rain and that they would whine about it a bit but that everything would be just fine. But then I started looking into this storm a bit more. It turns out that this storm is even larger than Hurricane Katrina was. The National Oceanic and Atmospheric Administration has categorized the destructive potential of this storm to be 5.8 on a scale that goes from 0 to 6. So don’t be fooled when you hear that this is only a “category 1 storm” or that the maximum winds will only be around 80 MPH. It is the unprecedented size of this storm and the mind boggling storm surges that it is producing that truly make it dangerous. 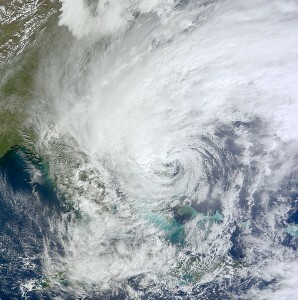 It is being reported that Hurricane Sandy is more than 1,000 miles across from one end to the other. Meteorologists have never seen anything quite like this before, and we are most definitely in unprecedented territory. One meteorologist is already projecting that this megastorm could cause 100 billion dollars in damage, but the true amount of devastation will likely not be fully known for weeks. If you live in the northeast part of the United States, you definitely want to buckle up because you are about to get absolutely hammered. #1 Hurricane Sandy has been dubbed “the Frankenstorm” and many believe that this could be the worst storm to hit the east coast in 100 years. #2 This is an absolutely massive megastorm. It is being reported that tropical storm-force winds can be felt 520 miles away from the center of the storm. Since records of storm size began in 1988, no tropical storm or hurricane has been larger, reports meteorologist Jeff Masters of the Weather Underground. #4 Hurricane Sandy has already forced the cancellation of over 5,000 flights. 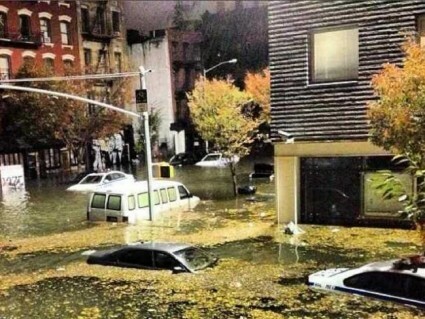 #5 Mayor Bloomberg has announced a mandatory evacuation for all New York City residents that are living in “Zone A”. #6 It is being projected that the storm surge from Hurricane Sandy could be up to 15 feet above sea level in some areas of New York City. #7 New York City could potentially experience wind speeds of 80 MPH or higher. #8 Subway service in New York City is being shut down at 7 PM on Sunday evening. There is a very real possibility that the New York City subway system could be severely flooded by this storm. That could be quite crippling, because about 4.3 million people ride the subway in New York every single day. #9 It has been announced that all public schools in New York City will be closed on Monday. #10 Schools in Boston will be shut down on Monday as well. #11 The trading floor of the New York Stock Exchange will be closed on Monday. 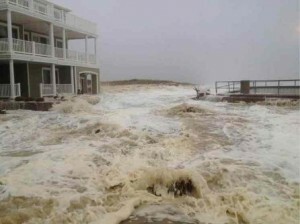 #12 50,000 people living along the coast in Delaware have been ordered to evacuate. #13 Some parts of Kentucky, West Virginia and North Carolina could get up to 2 feet of snow. #14 It is being estimated that 10 million people living along the east coast could lose power thanks to Hurricane Sandy. #15 A state of emergency has already been declared in New York, New Jersey, Connecticut, Pennsylvania, Maryland and Virginia. #16 Approximately 50 million people live in the areas that will be directly affected by this storm. #17 Meteorologist Mike Smith of AccuWeather Enterprise Solutions is projecting that Hurricane Sandy could potentially cause a total of 100 billion dollars in damage to the U.S. economy. That would make it a far more costly disaster than Hurricane Katrina. Louis Uccellini, environmental prediction chief for the National Oceanic and Atmospheric Administration, told The Associated Press that given Sandy’s due east-to-west track into New Jersey, that puts the worst of the storm surge just north in New York City, Long Island and northern New Jersey. “Yes, this is the worst case scenario,” he said. Please do not underestimate this storm. This is unlike anything that any of us have ever seen before. If you live in a part of the country that is being affected by this storm, please feel free to leave a comment and let us know what you are seeing in your area. It is going to be a crazy couple of days.